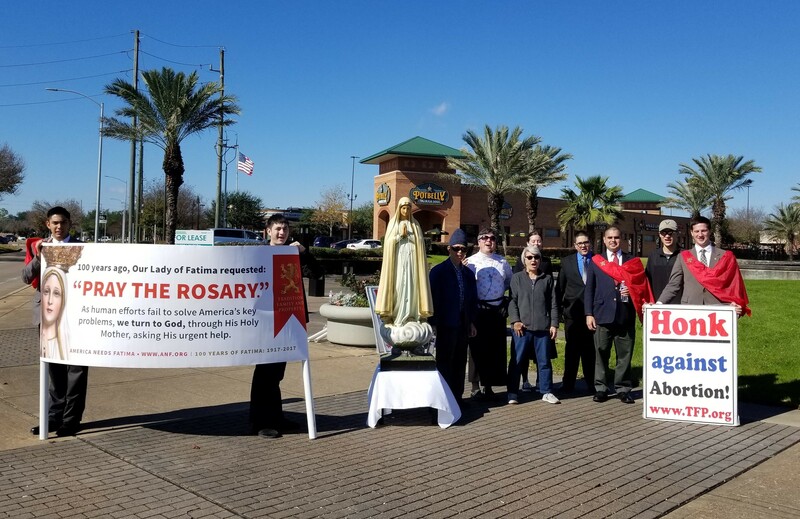 On Saturday, January 12th, TFP-Louisiana members in Houston participated in the first monthly public rosary rally of 2019. The rally focused on praying for the conversion of America, and participants also held signs which asked passersby to honk their car horns for the right to life of the preborn. The rally is one of two such public events held in Houston every month. The Houston monthly rosary rallies are inspired by the public square Rosary rallies of America Needs Fatima. Each year, America Needs Fatima holds the Public Square Rosary Crusade, with twenty thousand plus rosary rallies in cities all across the country. In 2018, in addition to the 21,266 US rallies done by America Needs Fatima rally captains, another 1,752 other rallies were held by ANF friends in 26 countries around the world, for a combined total of 23,018 rallies worldwide. 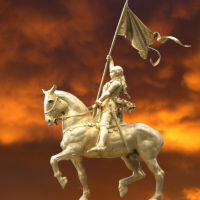 The rallies always take place on the closest Saturday to October 13, the feast of the last apparition of Our Lady of Fatima and the Miracle of the Sun. Besides the October Rosary rallies, many Rally Captains hold monthly Rosaries as well. In Houston, the public square rosary rallies have been held every month since February of 2017, nearly two years! The next monthly rally will be the 50th public rosary since the TFP-Louisiana’s center in Houston was established. It’s safe to say that by now, the public act of prayer has become very familiar to Houston residents who come to expect it every month while driving by on their busy Saturday afternoon. Each time the rosary is recited in public, a particular promise of Our Lord comes to mind, “Every one therefore that shall confess me before men, I will also confess him before my Father who is in heaven” (Matt. 10:32).